Do you remember the Vanilla Bean Porter Caramel Sauce I posted a few days ago? I decided that instead of eating it all straight off the spoon I should do something fun with it. Then, the cupcakes with the really long name were born. These little beauties are pretty darn awesome if you ask me, but of course I made them, so sometimes I can be bias. I will say that of course I don't like the outcome of everything I make. These? I'm quite proud. 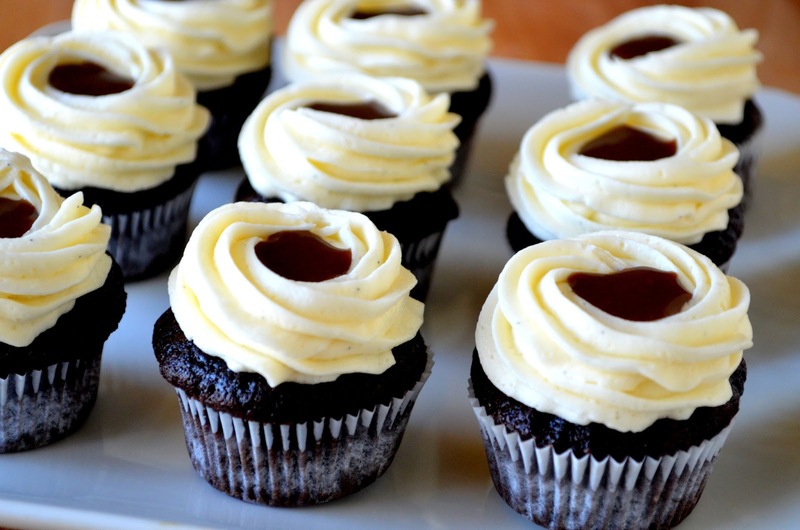 Previously I have been known in my circle of friends for a little something we like to call a grey salt caramel cupcake which is similar to this one. It has the same dark chocolate cupcake but it's topped with a chocolate frosting and a grey salt caramel in the little "cup" on the top. You can see where this inspiration came from of course. I think these may just overtake the grey salt caramel cupcake in popularity if some of my friends try them. 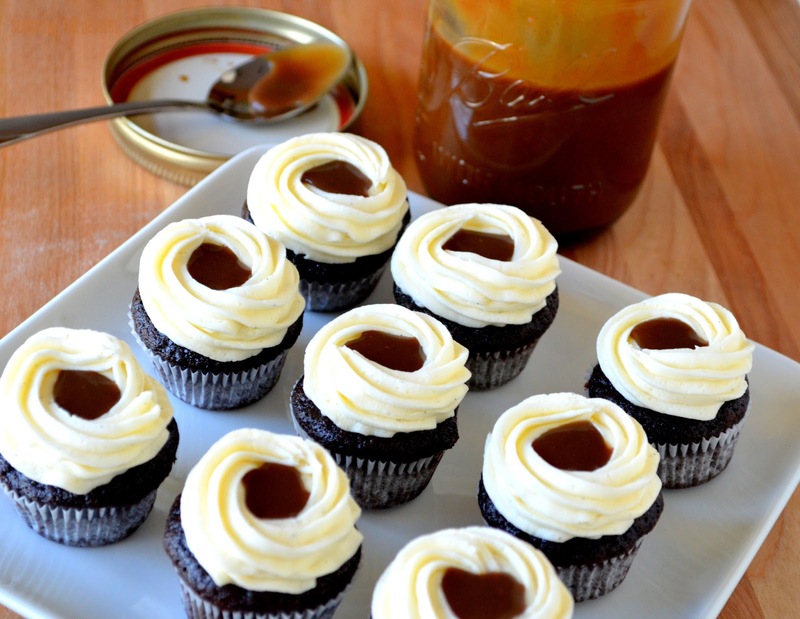 You could use any caramel sauce that you want to of course but I think that the Vanilla Bean Porter Caramel Sauce really adds to the flavor of the cupcake. I don't make chocolate cake to often, but when I do, it's this recipe. Almost always. You don't taste the coffee in it but the coffee makes the chocolate flavor more pronounced. It's sort of like the whole thing with mayonnaise cake, you don't taste the mayonnaise but it's a super moist cake. So if you've been looking for a chocolate cake recipe, here it is! Let me know what you think or if you have any questions. 1. Preheat oven to 350F. Line three 12-cup mini muffin pans with paper cups, set aside. 2. In a small bowl stir together the chocolate chips and coffee until the chocolate is melted. 3. In the bowl of a mixer, blend the egg for 3-4 minutes or until it is lemon colored and thickened. Slowly add in the oil, milk, and vanilla until completely blended. Add the chocolate-coffee mixture and stir until blended. 4. Add the sugar, flour, baking soda, baking powder, and salt, mix until blended evenly (batter will be thin). 5. Divide the batter between the mini muffin cups, filling them about ¾ - ⅘’s full. Bake the cupcakes for 11-12 minutes or until a toothpick inserted in center comes out clean. If making 12 standard cupcakes, bake 17-19 minutes. Cool on wire rack. 6. In the bowl of a mixer blend together the butter, powdered sugar, and vanilla bean paste until blended, adding ½ cup powdered sugar at a time, blending between additions. Add the milk, mix until completely blended and smooth. 7. Top cooled cupcakes with frosting making a “cup shape” on top, then fill “cup” with caramel. Ugh! 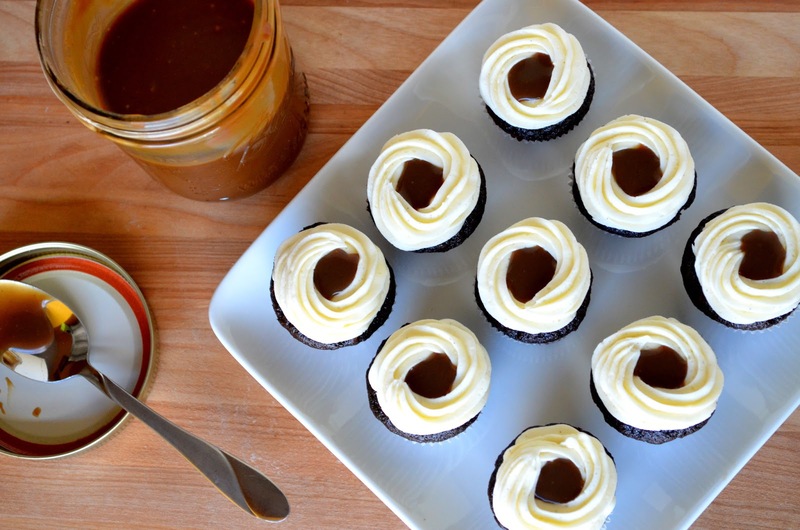 I absolutely love salted caramel and how it is in the middle of these cupcakes is such a great idea! Stunning! I think you have some spectacular cupcakes here! Love the caramel pooled in the middle of the frosting.! Would be thrilled if you'd share this at Saturday Share With Us! Oh, my. These sound incredible!!! I'm a sucker for anything caramel and these cupcakes rate extremely high on the delicious scale!!! I'm so glad you shared these with Saturday Share With Us, because I have to try these! Yum, yum and yum!!! Mmmmm!! Yumm-o! Pinned! Thanks for sharing at Two Cup Tuesday at Pint Sized Baker! Hope to see you there again on Monday night! 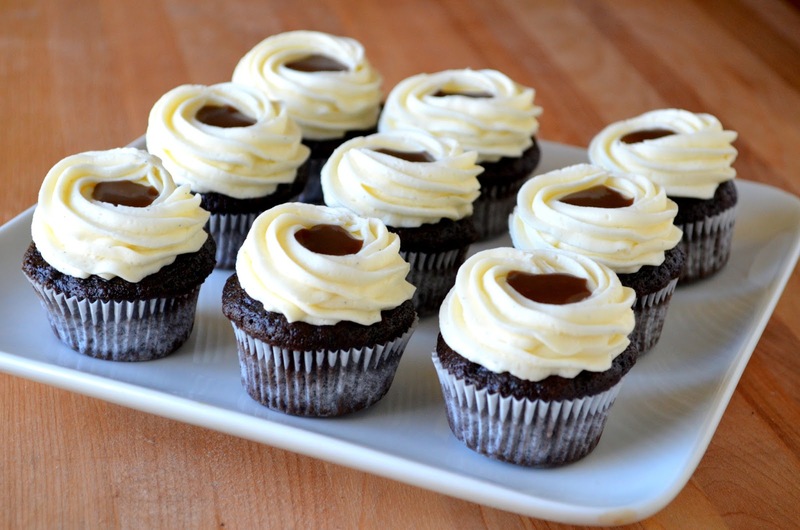 These look fabulous -- chocolate, vanilla bean and caramel! Pinned. Thanks so much for sharing on Busy Monday! It looks soooo cute and delicious!!!! By the way, I'm hosting a recipe link up party on my blog and would be thrilled if you decided to participate!! !